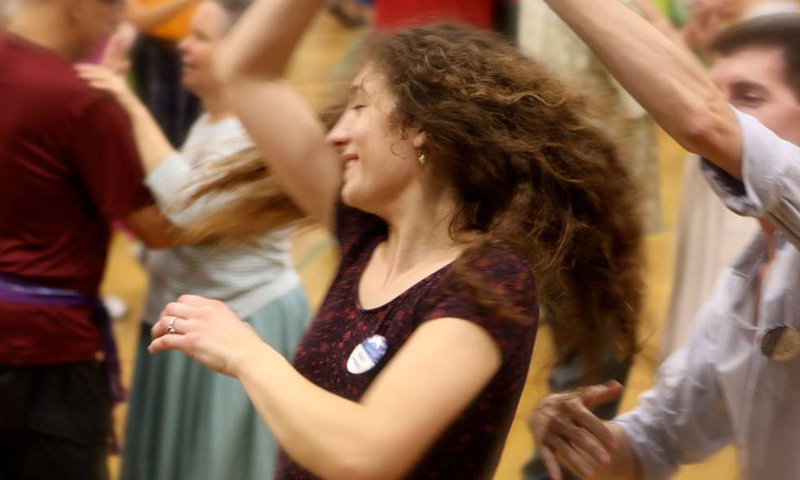 So what is contra dance? Contra dance has origins from English country dance, Scottish and French dances, and strong influence from Appalachia. Contra dancing is danced in long lines of couples/pairs formed starting from the stage and down the dance hall; couples progress up and down these lines, dancing with every other couple in the line. The dance is led by a caller who teaches the sequence of figures in the dance before the music starts and continues to call through all or part of the dance. Each time through the dance takes 64 beats, after which the pattern is repeated. 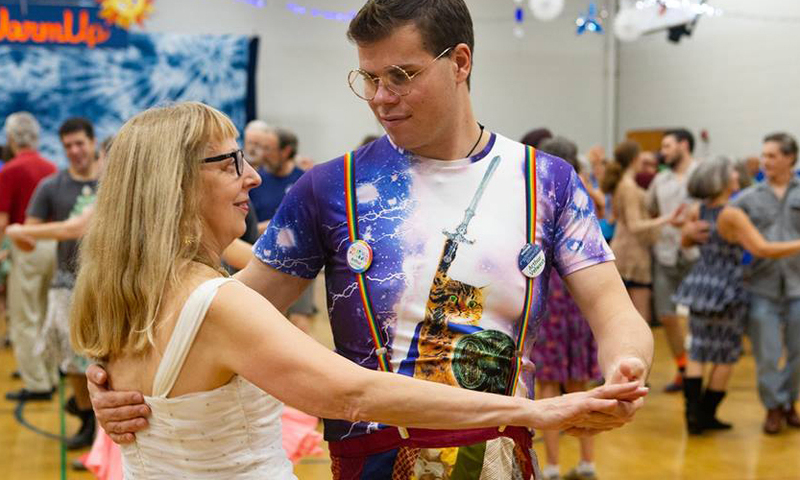 Contra dance incorporates various figures, the Balance & Swing, Do-Si-Do, Promenade and several others, each of which will be taught as needed in a walk-through preceding each dance or during the beginners’ lesson. What kind of music will I hear? Music played for contra dances includes, but is not limited to Irish, Scottish, old-time and French-Canadian folk tunes. The fiddle is considered the core instrument, though other instruments such as the guitar, banjo, bass, mandolin and percussion instruments are played as well. Adults pay $8.00 and ages 12-26 pay $4.00. Children under 12 dance for free; they must be accompanied by an adult. Big Scioty adult members pay $7.00, and ages 12-26 pay $3.00. We take cash or check. All Soles Contra and Squares is another local contra group (we include their dances in our schedule). Their admission fees are the same but they don’t offer membership prices. Wear cool and comfortable clothes (you will get warm) and clean dry shoes that will let you move easily on our nice wooden floor. To say on waste, bring a water bottle. We supply water and snacks, but welcome any additional snack donations! Alcohol beverages are not permitted. There is no need to bring a partner; we change partners at the end of every dance (about every 12-15 minutes) and you will find many friendly people to dance with. But we would love it if you brought your friends! and help others have a good time, too. most from the dance and create a great dance community! Single dancers and first-timers are welcome. You need not bring your own dance partner. Each dance couple is composed of a “Lady” and a “Gent” and the dance normally starts with the lady on the right. When dancing with a partner of the same gender, choose which role you will dance. The terms “Lady” and “Gent” are mainly a description of the position of the dancer – so feel free to dance in either role. All dances are completely explained and “walked through” by the caller before they are danced. If you make a mistake or miss a figure, don’t worry about it. Relax, have fun and enjoy the dance! Beginners improve more quickly if they dance with more experienced partners. We recommend that two beginners should wait to dance with each other until later in the evening. We strongly encourage everyone to switch partners at each dance during the evening to learn to dance with a variety of partners. Everyone should feel free to ask anyone else to dance. There is a bit of bravery involved in asking someone to dance. If you must decline a dance, smile and thank the person who asked you. Be sensitive to the preferences of your fellow dancers. Never apply excessive force, squeeze with an inescapable grip, or push a fellow dancer beyond their comfort level. Not only will this spoil the fun, but it may also risk serious injury. Experienced dancers are encouraged to initiate contact and welcome newcomers. Smiling, eye contact, and flirtation can be part of the fun. Take care not to read more into a gesture than is intended. Use common sense, discretion, and respect others’ personal space. If your partner forgets a step, be gentle when helping your partner to return to the “swing of things.” Encourage your partner with a smile. Remember, today’s beginners are the good dancers of tomorrow and are the life blood of keeping our dance continuing through the years. If you have an injury or impairment, let your partner know so they can be considerate and careful. Be sensitive to the safety of your fellow dancers. Never force a partner to twirl or jerk a partner’s hand, arm or shoulder. Do ask your partner if it is ok before doing your own special swing move. Foster a culture of respect and consent when interacting with everyone on and off the dance floor. Don’t make assumptions about what someone else wants. Just because they dance a certain way with one partner does not mean they want to dance that way with everyone. Communicate! Ask if your partner wants to be twirled, dipped, lifted off the floor, etc. Respect any requests to cease an interaction that is making someone uncomfortable. Remember that your partner’s needs, abilities, and comfort zone may be different from yours. Err on the side of being respectful. If you are an experienced dancer, and would like to offer help, ask first. Unsolicited teaching can be anxiety producing and awkward. Hands four: Most dances begin with “hands four,” meaning four people, i.e. two couples, join hands. Couple #1 faces down the hall, away from the music, while couple #2 faces up the hall. It begins at the head of the line and continues down until all couples are paired. Eye contact: Whenever executing a figure, make eye contact with the person with whom you are dancing. This does not signal a proposition but merely acknowledges a connection with your fellow dancers. It also enhances balance and reduces dizziness during swinging. If eye contact is uncomfortable for you, try looking at your partner’s ear, collar, etc. Give Weight: Remember how as children, you would lock elbows and swing each other around. This is what is meant by giving weight. It is the physical connection between dancers, whether in a swing, balance, courtesy turn, etc. Each dancer counterbalances their own weight with that of fellow dancers to propel one another through the figures. It enhances grace, fluidity, and continuity throughout the dance. Swing: Square your shoulders parallel with your partner and hold your arms firm but not rigid. Don’t squeeze too tightly or bend your partner’s wrists. Though you and your partner may choose to swing vigorously, always maintain balance, control your space, and respect the spatial needs of the other dancers. Swing hold: Your supporting hand – right for the gent’s role, left for the lady’s role – should be on your partner’s upper back for a safe hold. Please be aware that some dancers do not like to swing too vigorously; respect any request to be more gentle. Swing steps: Strive for a smooth rhythmic step – bouncing up and down can be very uncomfortable for a partner. Twirling: “Twirling the lady” is a popular embellishment. Though the gent typically leads the lady into a twirl, it is the lady’s prerogative to follow the lead or override it. Timing: Dance each figure within its musical phrase. Remember, “better never than late.” If you lose your place and all else fails, wait for the inevitable partner swing, find your partner, and pick up from there. Graceful Exit: If you must drop out mid-dance (this is rare), please try to hang on till you reach the end of the line. From there, you can usually step out without disrupting the other dancers in the line. 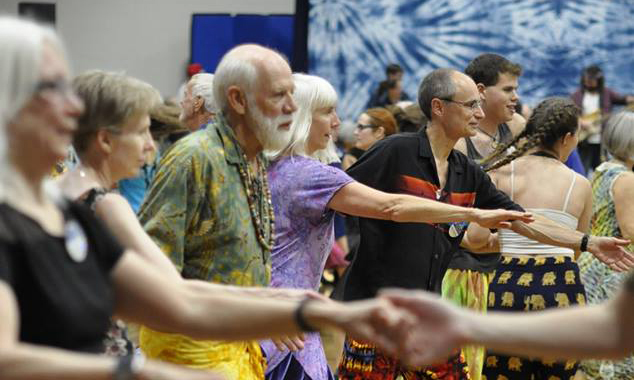 Flourishes: Many experienced contra dancers improvise or use flourishes during a dance. Dancing in time to the music and helping your partner to be on time are always more important than embellishments. When improvising, maintain a sense of “place” within your line. Respect, discretion, and common sense are your best guide to what is or is not appropriate; be sensitive to new dancers who may not be ready to try twirls or may have issues with dizziness. In order to maintain a safe environment for both children and adults, we request that parents prevent non-participating children from coming on the dance floor during the dance. Interested children are welcome to learn the dance by attending our beginners’ classes. Big Scioty does not offer child care. When the caller is doing a walk though, pay attention, follow the instructions, and be patient while others learn. Take “hands four” promptly, so everyone can start the fun of dancing. We are honored to have live music and experienced callers. Please thank them – they appreciate it! We provide water; bring a bottle to save on plastic waste. We love it when people bring snacks to share. No dress code! Just wear clothes that will keep you cool and allow you to move in comfort. Avoid any jewelry that will catch on other’s clothes or scratch their hands or wrists. Remember your dance shoes. If you do not have shoes that you use only for dancing, please wipe the bottom of your shoes; we do not want to bring grit onto our nice wooden dance floor. If you perspire heavily, consider bringing an extra shirt and changing during the break. Please omit perfumes and scented products to accommodate dancers with allergies. 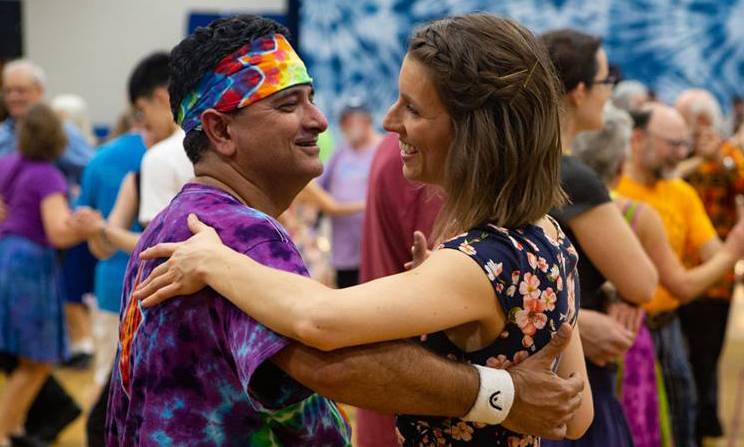 Big Scioty Contra Dance delights in presenting a warm, happy, comfortable, family-friendly environment where friends can gather to enjoy contra dancing. We want YOU to feel safe and comfortable here and to look forward to dancing with us again. If there is something we can do to make our dances better, please let us know. If someone or something makes you uncomfortable, please talk to a board member (Richard Ades, Katrina Castergine, Ellie Nowels, or Martha Shaw) or else drop an email to bigsciotycontra@gmail.com. If there is something we are doing well, please tell us about that, too!